The taking of freshwater mussels, except Corbicula, is unlawful without a permit from SCDNR. A freshwater fishing license is required to take any freshwater mussel species. and, altered water flows due to impoundments. Freshwater mussels are an integral part of an aquatic ecosystem. They serve as indicators of a healthy ecosystem. When mussels began to disappear from a water body, it is a clear sign that something is wrong. Mussels filter large volumes of water, removing food items such as algae, bacteria, diatoms and fine particulate organic material. Mussels are important to ecosystems. However, when a non-native mussel species is introduced into a system, it is proven that the natural balance of the ecosystem is disturbed—as is the case with the non-native, invasive Asian clam (Corbicula spp.). 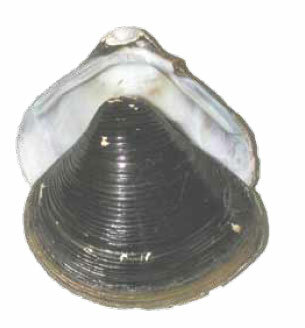 The Asian clam (Corbicula fluminea) was first reported in the United States in Washington's Columbia River in the 1930s. It was likely introduced intentionally for harvest and consumption purposes. Corbicula fluminea spread mostly through human activities, such as bait bucket dumping, aquaria releases into streams or canals, and intentional releases by people who bought the clams at food markets. Asian clams may also have been introduced accidentally in shipments of imported aquaculture species. Another pathway for dispersal is the passive movement of larvae in water currents. Since the initial introduction into the United States in Washington's Columbia River in the 1930s, the Asian clam spread across the country, with the first reports in South Carolina from the Pee Dee River in the late 1960s or early 70s. From there it spread to the Savannah River, the Santee Rivers, and throughout the state. Ecological impacts of Asian clam infestations include the altering of benthic substrate and increased competition with native species for food and habitat resources. Periodic massive die offs of the Asian clam have been linked to mortality of native freshwater mussels, and the clam has been blamed for the decline and local extinctions of several native freshwater mussel species.